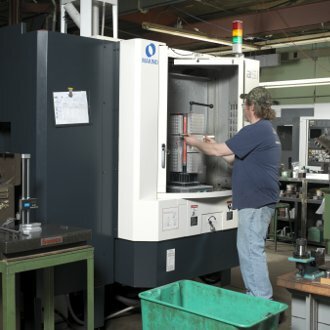 Townsend Machine Inc., of Chesterfield, N.J., performs part production and die/mold machining for a variety of markets, including water treatment, pump and aerospace. Some of its parts resemble standard plumbing pipes; but because they are used in aircraft construction, they require precision milling tolerances as tight as ±0.002 inch. The length can require the use of a 14-inch gun drill on both sides of the part, in order to complete a hole. The company felt that the future of its business lay in the production of complex, fast-turnaround parts with high-performance machinery. Due to rising costs, it also wanted to bring the gun-drilling operations it had been outsourcing back in-house. It needed a machine with gun-drilling capabilities that could also expand its capacity for standard part production. It decided to purchase a CNC horizontal machining center to replace its vertical machines. The company obtained a Makino a51 horizontal machining center, after another reputable shop that was already using a Makino CNC horizontal machining center for its own gun-drilling operations recommended it. Townsend’s gun-drilling supplier thought this plan was crazy and that a horizontal machining center would not work. Townsend proved the supplier wrong. Since purchasing the a51, Townsend has brought its gun-drilling applications back in-house, while dramatically improving part quality and cycle times. The rigidity of the a51 has produced repeatable results, including in aluminum and stainless steel, leaving parts looking like a single drill was used in these applications. Townsend is seeing greater throughput, reduced manual labor and cycle-time reductions of up to 70 percent in jobs transferred from its vertical machining centers to the a51. For example, it is producing three parts in the same time it took to produce a single part on the vertical machines. The improved chip removal of the a51 is providing better part quality and longer tool life, especially in deep pocket and drilling applications. In an aerospace locking mechanism, the company is producing no scrap, while achieving ±0.002-inch tolerance center-line positioning and repeatability within ±0.0005 inch. As a result of its investment in the a51, Townsend has won additional work, including a part that was previously elusive with past equipment. That same part is now being produced in a single setup on the new equipment, with positioning tolerances of 0.0005 inch or less. The new capabilities brought by this machine have not only improved upon current applications, but produced a fast return on investment.